Martial arts fans, prepare your Google Opinion Rewards money. 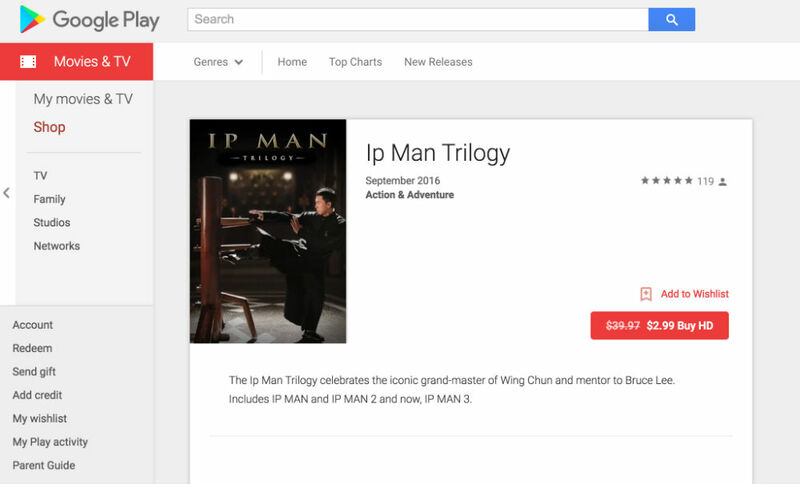 For a limited time, anyone can grab the Ip Man trilogy on Google Play for just $3, down from its typical price of about $40. Yes, all three Ip Man movies, in HD, for $3. If you have seen the name thrown around, but have yet to check it out, this is a golden opportunity. The first Ip Man movie follows the life of Yip Man, a grandmaster of Wing Chun and teacher of Bruce Lee. Throughout the first film, as well as the second and third, you will see enough martial arts action to fulfill all your needs, thanks to the incredible Donnie Yen (of Rogue One fame and countless other films in the genre). In the overall realm of martial arts, these are some great flicks. Seriously, it’s $3 in HD, go grab it.